Before we dive into terms, let's first define SEO, or search engine optimization, as the process of driving traffic to your website through “organic” search results on Google, or any other search engine. One of the benefits of organic search is that it’s a free method of driving traffic, compared to paid ad search. Keywords you place in your content. This data helps sites perform better or worse on search results, so it's vital that you analyze the type of content you create. 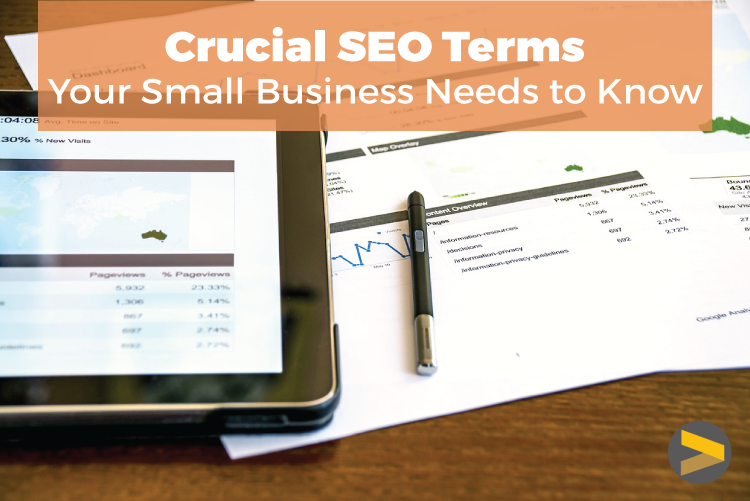 If some of these terms are a bit over your head, don’t worry, we will cover SEO terms shortly. As I stated before, SEO is cost-efficient for companies, small or large. Depending on whether you count productive time spent creating and upgrading content as a cost of SEO, it could be free! With budgets becoming tighter, companies are looking for new ways to gain traffic, leads and money. Companies should invest a portion of their marketing time to SEO, as how you perform on Google can either hurt or help your brand success. Here's a list of important key terms you should know for your success with SEO! ALT text is used as a description for your images within your site’s HTML (see HTML definition). Google sees ALT text, but not the image and humans see the image, but not the ALT text. When placing images in your site, or your content, be sure to place ALT text on your image. If it’s a picture of a cat, you could write “Orange Tabby Cat,” as the ALT text. Anchor text is the text that links to another web page from your current page. It is underlined and usually dark blue. This helps Google understand where you are being directed if you click on the link. Always make sure your anchor text is clear and relevant to the directed page. You might already know what a blog is, but did you know blogs are absolutely crucial in proper SEO implication? A blog is chock full of important vocabulary and possible authoritative links that could help your site rank better. If you offer travel packages and tours, create a blog about different destinations. This will both help your SEO goals, and also help bring people to your site by offering them something fun exciting and hopefully relevant to read. If you have downloadable offers, this is a perfect place to link to those. Include links to reputable, trustworthy sources of knowledge in your blog. Be careful though, because not all links are good links, and linking to not-reputable sites can hurt your SEO efforts. HTML and CSS are very similar, but each has distinct differences. HTML and CSS are the coding behind your website. When you build a website, it’s predominantly built using these two website markup languages. HTML includes ALT text and anchor text, along with other things. Make sure your HTML is clean as possible, so Google can breeze through your site and pick up the important data. CSS, or cascading style sheets, is more of the layout coding, which includes the headers, colors and other style properties. Keywords are quintessential to SEO. Without keywords, SEO truly wouldn’t be what it is today. Keywords are words that you can place in your anchor text, and throughout your content. The spiders I’ve been referencing pick up and add those keywords to their data. Using that data, the algorithm decides where you rank in a search result. You want your content to have keywords in it, but not be overflowing. Use one keyword a maximum of 5 times throughout a page. The big difference between short-tail keywords and long-tail keywords is that short-tail keywords generally have higher search volume, but more competition. Long-tail keywords have lower search volume, but less competition and a higher conversion rate. Learn everything you need about short and long-tail keywords by clicking here. Finally! We talk about the spiders. Spiders or “web crawlers” are an automated script that browses through the world wide web. They scan, dissect and collect data that Google uses to see up-to-date content that is being created. When spiders look at your pages, they look at the words within the page (that’s why keywords are important) and where the words were found. White hat is an SEO term that means you are engaging in good SEO practices that focus on the human audience and completely follow search engine rules. Black hat is an SEO term that means you’re using aggressive or bad SEO practices that don’t follow search engine guidelines. We’ll walk through a few scenarios below that are considered white or black hat. Do you need assistance applying SEO to your current marketing strategy, contact Milwaukee marketing agency, Accelity Marketing.